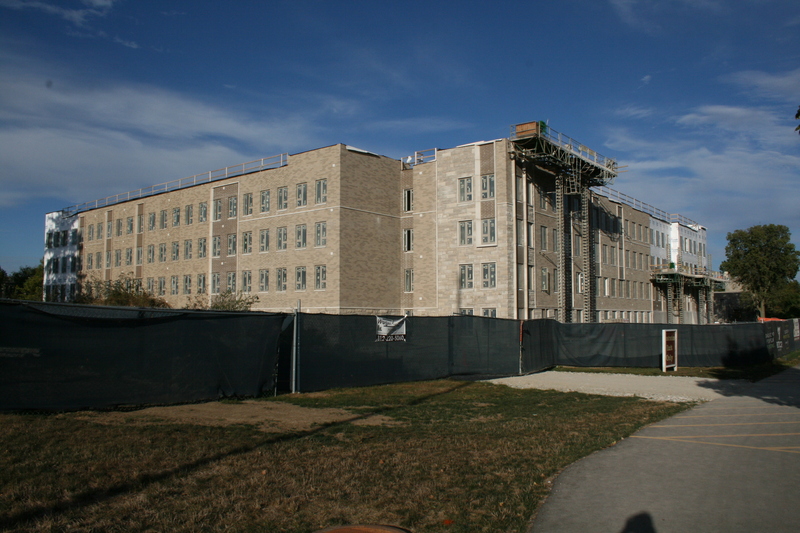 Irvington House is currently under construction and sits on Hampton Drive. It is set to open for the fall 2018 semester. Photo by Zach Bellavia. The university announced Sept. 29 the name of the new residence hall. Irvington House will take the place of Schwitzer Hall, which was torn down last winter. In the email, Frank Ross, vice president of student affairs, said naming the building “Irvington House” connects our present-day campus with Butler University’s past history. Butler was originally located at 13th Street and College Avenue. After 20 years, the board of directors sold that land and relocated the campus to Irvington where Butler stayed for 53 years. Butler then moved to its current location in Fairview. Anne Flaherty, dean of student life, said in an email interview that Schwitzer Hall was named after Louis Schwitzer, who was an engineer and businessman who profited from his work with hydraulics. He also raced cars at the Indianapolis Motor Speedway. Flaherty said the name Schwitzer lived with the former building. Because there is a new building, it gave the opportunity for a new name. Both names are considered ‘placeholder’ names, meaning that the buildings could be renamed in honor of a future donor, Flaherty said. Flaherty said she was in the meeting when the name Fairview House was suggested. Junior Courtney Sweeney, human communications and organizational leadership major, lived in Schwitzer Hall her first year at Butler. Sweeney explained that the new name Irvington House is similar to Irwin library, just as Fairview House is similar to the academic building Fairbanks. Megan Watson, junior elementary education major, also lived in Schwitzer Hall her first year. Watson agrees with Sweeney that many of the buildings on campus sound alike. Watson wishes they chose a name that is more related to what Butler looks like today. Sweeney said she thinks the new name will not change how alumni and older students remember the building. The official ribbon cutting for the new Irvington House building will be in the fall of 2018.